Have you been frustrated with the rising energy bills? Want a heater which can provide hot water without weighing heavily on your pocket? Don’t want to designate much space in your house for the upcoming heater? Want to make a home investment that could pay you back? 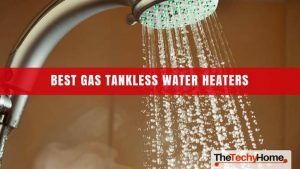 If your answer to any of these questions is in the affirmative, you need the Navien NPE-240-A Tankless Gas Water Heater. Have I got any facts to back my recommendation, I hear you ask? Luckily, I do. 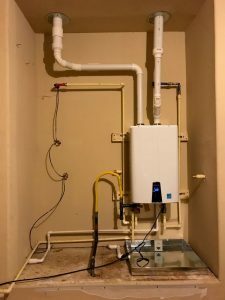 Unlike many companies which have jumped on the bandwagon after seeing the success of tankless water heaters, the name of Navien is respected in the market. Although their products are expensive, the brilliant performance and low running cost of Navien NPE-240-A means you will get a good value for your money. Did I just say “Low Running Cost”? You bet I do. 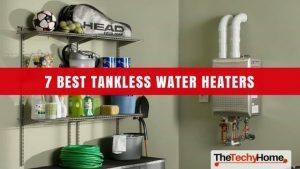 While all tankless water heaters strip 10 to 20% off your energy-bills, the Navien NPE-240-A – thanks to its ultra-condensing efficiency (explained later), takes the game to a whole new level. Also, unlike traditional heaters, the heating element of this heater shuts down as soon as you turn off the water faucet. 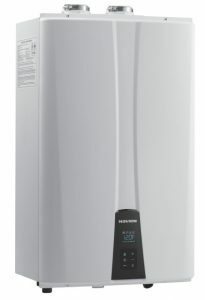 Consequently, with no standby heat loss and better efficiency, the Navien NPE-240-A Tankless Gas Water Heater has a ridiculously low running cost. Until now, our attention was fixated on the general aspects of this heater. From now on, we’ll turn our attention to the aspects which can either convince or dissuade you from buying this heater. Whether you buy this heater or pass on the chance to do so depends on your requirements and this heater meeting them. Since they outnumbered the bad features, we decided to review the better features offered by this heater at first. Take a look and decide whether or not they meet your requirements. With devices i.e. heaters, pumps, and even washing machines, we only tend to look at their performance during our visit to the local shopper’s place. It is because of our opinion that if the features are good, we can manage even if the product is a little difficult to use. Thankfully, Navien didn’t think like that while designing this heater, meaning this heater is a cinch to use. The best example of the user-friendliness of this heater is the arrows located on its front side and which are to be used to adjust the temperature. By eradicating the knob and replacing it with arrow buttons, Navien has made sure you get the water at your desired temperature. While using the arrows for setting temperature, you won’t be doing so in the thin air, for there will be a screen above the arrows giving you the heater’s inside temperature. If you have children or elderly at home who can be at risk of burns from the heater, the control over the heater’s temperature – as provided by its arrows, makes it a must-have. Though it has weighed heavily on the capital cost of this heater, the stainless steel heater would justify its exclusion by lasting for decades. As people with a know-how of heaters might testify, heat exchangers have to operate in very harsh environments. Apart from tolerating the vagaries of the water quality system, they have to tolerate extreme mechanical and thermal stresses while also making sure the effects of corrosive substances do not get to them. Hence, if you want heat exchangers operating in such conditions to last decades, you have no choice but to go for the best. Thankfully, Navien has done just that by opting for a stainless steel exchanger. Since they work better in a wide range of water pH, stainless steel exchangers are better placed to find the onslaught of corrosive substances. Also, even for high-intensity operations, a stainless steel exchanger would neither warp nor breakdown while giving off peak flow. Thus, while they cost more at first then, let’s say, aluminum heat exchanger, their reliability, sturdiness, and corrosion resistance combine to give stainless steel exchangers a longer lifespan. Consequently, when viewed in hindsight, they provide a cost-efficient solution for decades. 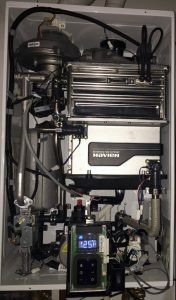 Of all the tankless heaters Navien has churned out of its factory of late, the NPE 240-A is the most powerful, as suggested by its mammoth flowrate. It means that while Navien designed it for residential applications, even commercial users can take advantage of the huge flowrate on offer. 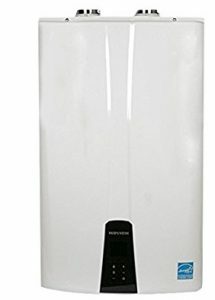 For, if you want this heater to give the water a temperature raise of 45*, 11.2GPM water flowrate will be on offer, which means enough hot water for seven bathrooms and numerous sinks to function simultaneously. Provided you do not want such searing hot water – and are instead looking for a 35* rise in water temperature, the water flowrate provided by this heater would go up to 12.2GPM per minute. Despite providing such gigantic flow rates, the Navien NPE-240-A Tankless Gas Water Heater has an outrageously low minimum flow rate of 0.01GPM. Put simply, just turn ON the tap, and the heater will get on its pedestal. If you would like to see the price -> Click Here! Almost all of us can recount an anecdote of the time when we were forced to shower with cold water, despite the fact that the heater on our balcony was still “running”. Thankfully, this heater would give you no such memories due to its intelligent preheating technology. Due to this technology, this heater will recognize your daily patterns of hot water usage. In this way, without you lifting even a finger, the heater will automatically heat water before supplying it to the fixtures. However, if you are skeptical of whether any such technology exists, it is a fact that home heating systems have been using it for ages. Hence, the fact that Navien used it in its heater shouldn’t come as a surprise. According to NOx emission standards, as enacted by the US Government, you cannot use or sell a heating equipment as long as its NOx emission level remains above 30ppm. Thankfully, while the ceiling is at 30ppm, the Navien NPE-240-A Tankless Gas Water Heater has been able to limit its NOx emissions at less than 20ppm. It does the same by using a metal fiber burner which supplies both gas and air in consistent quality to improve the combustion efficiency. Hence, if you are concerned about the environment, and want to your carbon footprint to be small, you need to have this heater. Though largely inconsequential in number, the one bad feature of this heater would dissuade most people from going after it. Take a look. As long as you aren’t living in a large home or you don’t have a large household with huge hot water requirements, it seems impractical to pay such an astronomical price for this heater. Yes, its performance is excellent and so is the flow rate provided but still, for people living in condos or small, one washroom apartments, the price of this heater is a huge barrier to overcome. If you think you have the financial muscle to purchase this heater, I see no reason why you shouldn’t go for it. Even if you live in a small apartment, the fact that this heater turns its heating system on at as low as 0.1GPM means it will serve you nicely.